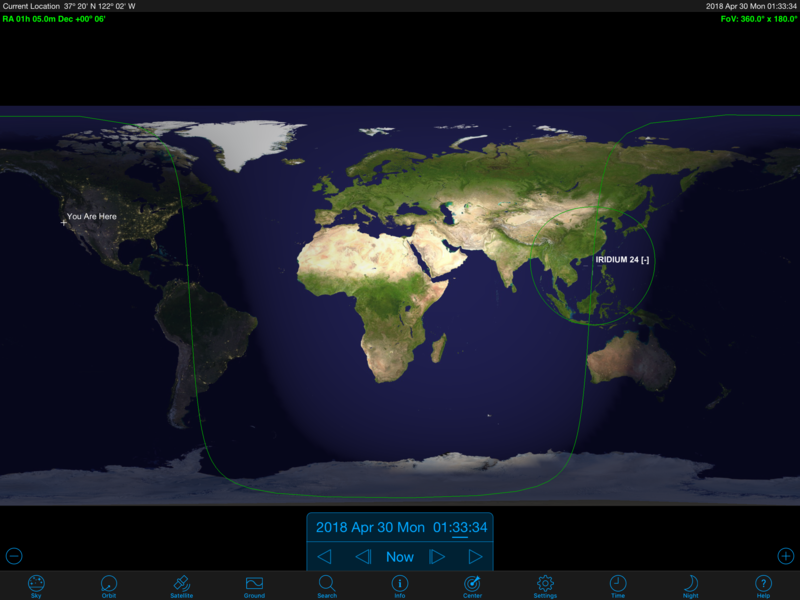 The Ground Track view shows where your satellite is orbiting over Earth using a 2D map of the world. You can swipe the map to center different parts of the world. You can pinch the map to zoom in or out. The map shows the position, name, and orbit of the satellite that you have selected from the Search view. The satellite’s orbit is shown as a green line wrapping around the Earth. The satellite’s visibility circle is also shown around the satellite. The satellite will be visible above the horizon from any part of the world inside the visibility circle. © Copyright Southern Stars Group, LLC. All Rights Reserved.